Welcome to Day 5 of Unit 4: Android Game Development. In the previous 4 lessons, we discussed much about Android development. Now, we begin building our game framework. Our plan is to create a general framework that allows our game to interact smoothly with Android. Once we have done that, you will be able to create your own games on top of this framework, and I will demonstrate how to do that by developing the Robot game (from the previous Units) on Android. As this framework is very general, you can write it once, add to it, and reuse it in various projects. The framework developed below is reproduced from a book that I have written called The Beginner's Guide to Android Game Development. If you would like to explore the topics covered here in much more depth, I would really appreciate it if you purchased a copy. I believe that it will greatly aid your understanding of the why behind the code we write. Note 2: The source code in the book (all downloadable for free at jamescho7.com/book) is available under the open source MIT License. This means that you can use the code without restriction in your games, in your blogs, etc. Please click here to learn more about the license. Notes on changes: Previously, this tutorial series used an open source framework from a different book on this topic (Beginning Android Games by Mario Zechner of LibGDX) as I had used it when creating my first Android game. There was a bit of misunderstanding previously where Mario mistakenly thought that I was not giving him credit, but we were able to clear things up. Since then, I have been approached to write my own book on this topic, so I did, and I created a brand new framework in the process which is developed below. For anyone who wants to learn more about Android game development, Mario's book remains a great resource with a slightly different emphasis from my own. My book aims to help the absolute beginner create things one step at a time, starting from the simplest programs. Mario's book, on the other hand, is slightly more technical and assumes that you have a strong background in Java, but it really goes into great detail to give you complete control over each component of the games you make. We will begin by creating a generic Android Game project (that we can use as the basic structure of all our future games). 2. Go to File >> New >> Android Application Project. 3. 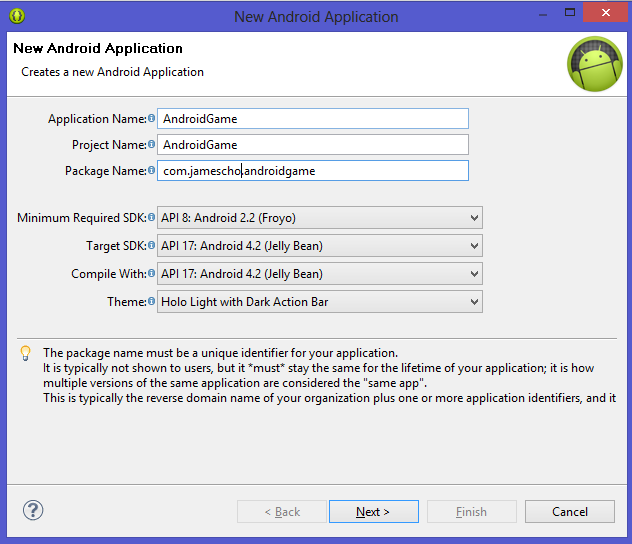 Enter the Application Name: AndroidGame, Project Name: AndroidGame, and Package Name: com.yourname.androidgame. Press next. 4. Uncheck the Create custom launcher icon and Create activity options in the next page. As we will not be running this project as an application, we do not need either. Now we are ready to begin developing. 1. A Game interface that ties every other interface together. 2. An Audio Interface that relies on (3.) a Music interface (for large audio files) and (4.) a Sound interface (for small audio files). 5. A Graphics interface that relies on (6.) an Image interface. 7. A Screen interface for displaying/changing game screens. 8. A FileIO interface for reading and writing files. 9. An Input Interface to take user input. We will also create A Pool class to collect objects together. Some of the code developed here is self-explanatory, the purpose of the some others can be deduced with some thought, and the rest might require a thorough explanation. As I demonstrate what goes into each interface, I will only explain what I feel is new and worth explaining. 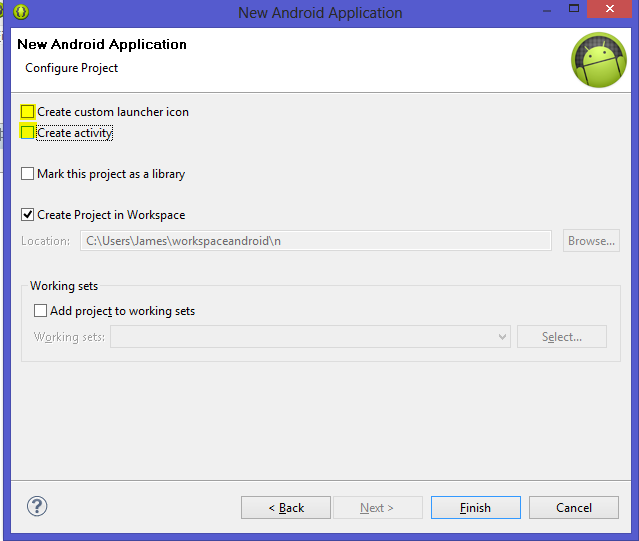 In your AndroidGame project's src folder, create a new Package. Name it com.yourname.framework. This is where our interface (all 10 classes) will be stored. 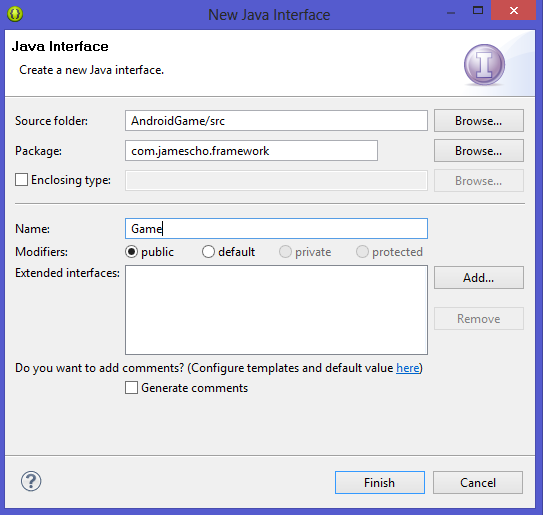 Right click on this package and create a new Java Interface. Call it Game. The contents of the "Game" Interface appear below. Warning: All the code samples that follow assume that you have the package com.jamescho.framework. If you use your own name, you will have to edit the "package" section in each class! ALSO: As a general rule, don't worry about errors! Wait until you have created every single class inside the interface before you worry about fixing the imports! Once you create the Game Interface as above, you will get several errors. An easy way to fix this is to put your mouse over each of the seven errors and apply a quick fix. Select the "Create interface..." quick fix for the first five errors (the last three are all Screen errors) (It does not really matter whether you create a Class or Interface because they are both .java files, and it's the content that determines the type). HOWEVER: DO NOT import (i.e. do NOT press Ctrl + Shift + O), as that will introduce many errors to your code later on. Audio, Input, FileIO, Graphics, Screen. We will now discuss them in the reverse order. This is an abstract class (not really an interface, which you cannot use to create objects with (although you can subclass it). It contains abstract methods (which state the parameters but are not implemented). Some of these methods will be familiar, such as paint and update (they are named as they were in Units 2 and 3). They now have a parameter called deltaTime (which takes into account how much time passed since the last time the method was called) that we can use to create framerate independent movement (more on this later). The Graphics interface contains many methods that we will use to draw images to the screen. It has the familiar drawImage method and many other self explanatory methods. clearScreen fills the entire screen with a color. ARGB in the last method stands for Alpha, Red, Green, and Blue. Using four parameters, you can specify an RGB color and an Alpha value (opacity). DO NOT IMPORT IMAGE. IT WILL BE CREATED LATER. This interface is very straightforward. We handle IOException so that we do not need a try and catch statement. SharedPreferences is an Android interface that lets you access and modify preference data. That is all you will need to know for now. The Input interface keeps track of touch events, with variables x, y, type (touch down, touch up, etc), and pointer (each point of contact on screen - Android supports multi-touch). This is the shortest interface of the day (except perhaps Sound). It uses the Music and Sound interfaces to create audio objects for use. You will get two errors: Music and Sound cannot be resolved. Apply the Quick Fix: "Create Interface..." for both. This will create the Music.java and Sound.java files that you can edit. This is a very straightforward interface. There are the familiar play, stop and pause methods, as well as ways to change volume, set looping (repeating an audio file), along with methods of checking the current state of the file. The dispose method removes the music file (allows it to be removed from Memory). The Sound interface just has a play and dispose method. Within the same Package, create a new Interface. Name it Image. This Image interface makes use of the ImageFormat from the Graphics interface. You might find this a bit odd as we are creating ints using methods. This will become more clear within context in the next lesson. This is a rather complex class. As such, we will return to this class after we see how it is used in the implementation of the interface. We have laid the groundwork for our first Android game. In Day 6, we will continue , so that we can build our game on top of it.